In World War II, two brothers joined the AIF and were both sent to Papua New Guinea. One perished on a POW troop ship, the worst maritime disaster in Australian history, the other returned to Australia and spent his life working for the benefit of others, he received an OAM for his service. The family wanted to remember the brothers and had collected memorabilia that needed to be preserved. At Fastframe we worked with the customer to design a complementary frame for each brother. To do this we scanned and restored pictures and documents for each brother and their medals were court mounted by David Hirsh Medal Mounting. Unfortunately, one of the brothers colour patches were not available, so the customer ingeniously made a copy from felt. The customer also wrote the brothers biographies, which we were able to include in the frame so that future generations could read and appreciate their stories. As always, Southern Cross Trophies & Engraving in Collingwood supplied us with the brass plates. The frame was finished off with UltraVue glass, which gives 70% UV protection and amazing clarity. Over the years, we have had many customers that have collections of sporting memorabilia that they want to update. An interesting example was a customer whose father was a jockey. The customer had a number of framed pictures of her father that were made when he won a race, these frames often included hand written details of the horse, the race and owners etc. As the pictures had been collected over a number of years, the framing, layout and inscriptions were often different, making an odd mix of styles. The customer wanted a simpler solution, so we designed a coordinated layout, scanned the original photos, restored and reprinted them and retyped the inscriptions. 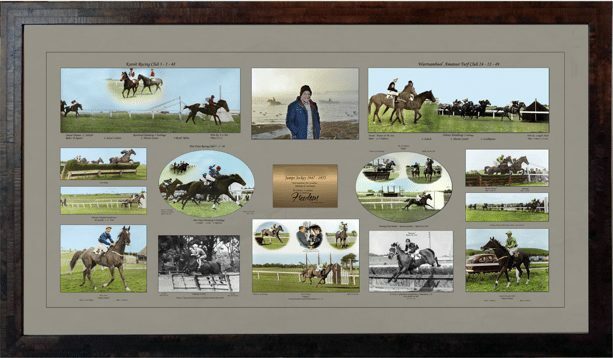 The end result was a single frame, containing all the photos and a brass plate with the jockey’s details. Where originally only one sibling could have the old frames hanging on their wall, or the group was divided and shared between siblings, now they can all have the opportunity to display their beloved father’s achievements. To celebrate the opening of the new East Brighton Football Club clubrooms, Fastframe was asked to restore, reprint and frame eight of the clubs premiership team photographs. These team photographs can be purchased by EBFC members from Fastframe, a 15 x 16 inch print is $40, a block mounted print $95 and a framed print is $175. Fastframe will donate 10% of all sales to the EBFC. If you wish to purchase a team photograph please contact Fastframe and advise the Premiership year(s) and whether you require a print, block mount or framed photograph. How to display Military Medals four ways ! 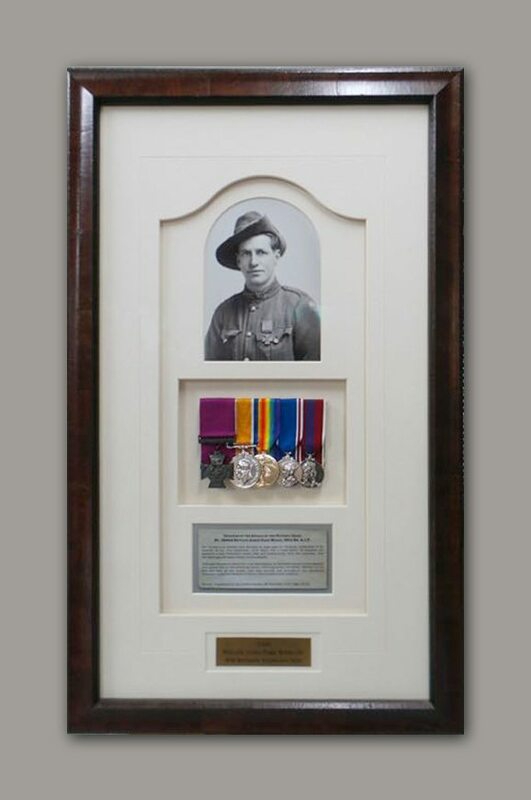 The framing of a families military medals, photos and memorabilia is a very personal and depends on what material is available, preferred size and style. 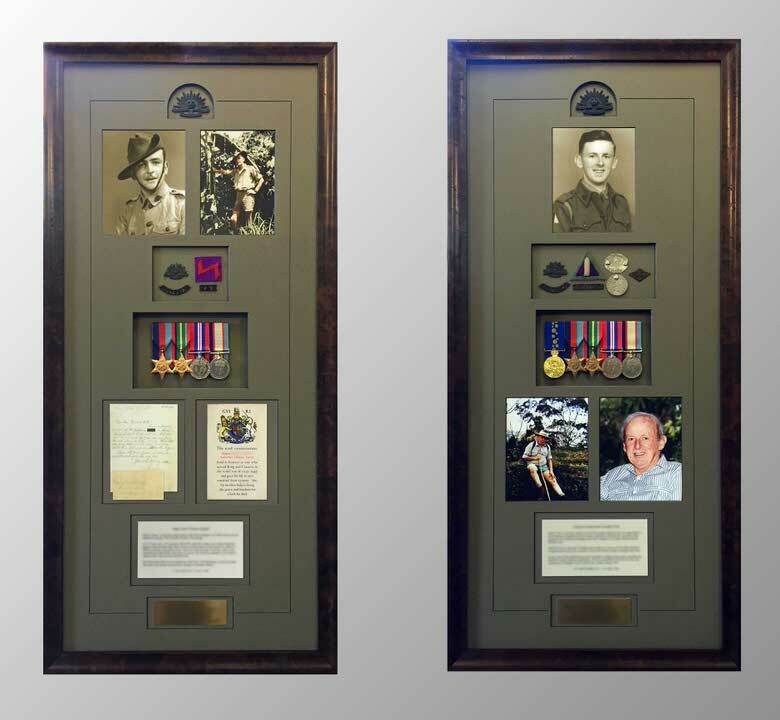 The following are examples of how we can frame military medals to suit different customer requirements. In each example, Fastframe scanned, restored and printed the images, and arranged for David Hirsh Medal Mounting in Glenhuntly to clean and court mount the old medals and to supply us with the medal replicas and other elements. As always, Southern Cross Trophies & Engraving in Collingwood supplied us with the brass plates. Example 1 – Medals, photos and military memorabilia – In addition to medals, customers often have a variety of photos and memorabilia, such as dog tags, insignias, pay books, badges, uniform buttons etc. Example 2 – Overlapping full size replica medals – By overlapping the medals the width of the frame can be reduced. Example 3 – Miniature medal display – Miniature medals are a good alternative if the customer doesn’t want to frame the original medals and requires a smaller display. 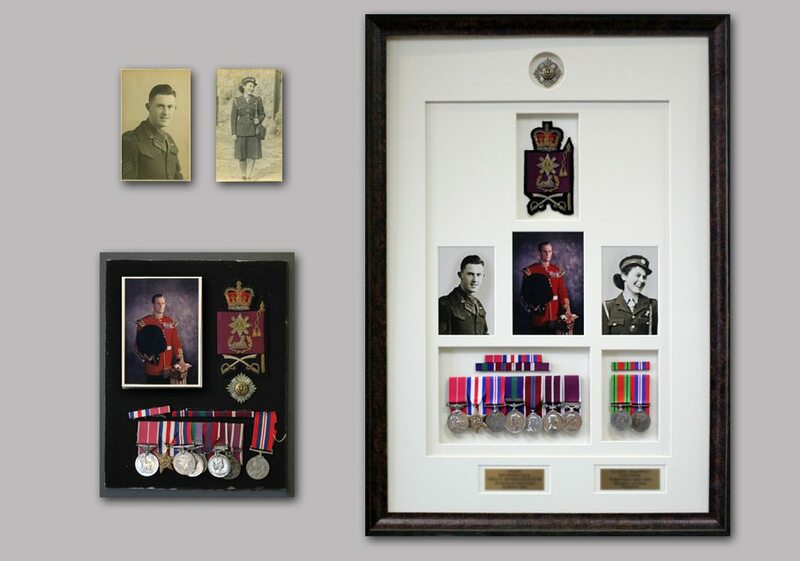 Example 4 – Opening frame – Some customers like to be able to remove their framed medals (especially original medals) so that they can be worn on special occasions. While Opening frames are not new, they are often bulky and look more like boxes than frames. To make a more elegant Opening frame, Fastframe uses a traditional frame on the front and a hidden box frame at the back to hold the medals. The front frame is hinged and can be easily opened to remove the medals. The glass used on all examples was UltraVue glass with 70% UV protection and amazing clarity. 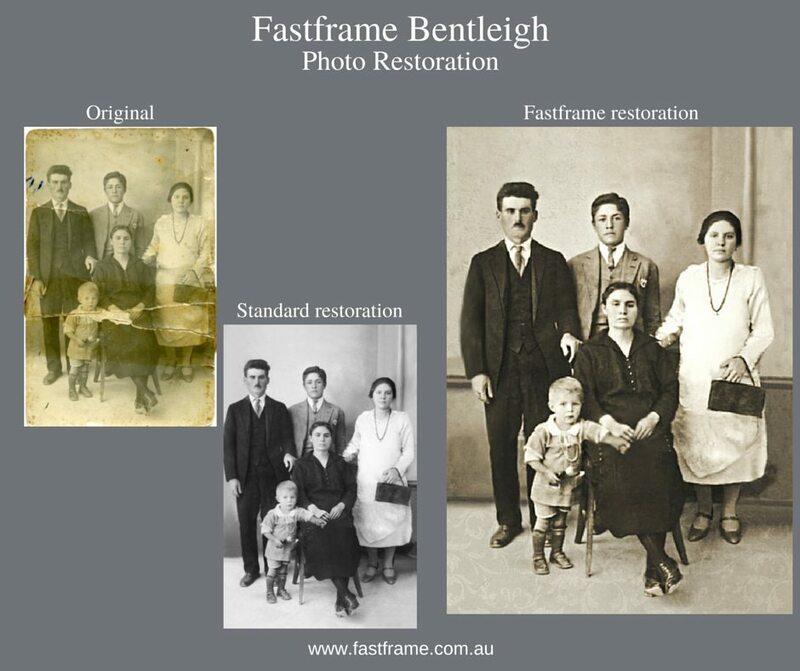 The following is an example of how Fastframe Bentleigh can add an extra dimension to image restoration. The original image had missing pieces, discolouration due the use of acidic tape on the back, spotting, fading and ageing. While Standard restoration would fix the above problems, the image still lacked finesse and balance. At Fastframe Bentleigh, we also enlarged the image to give relief to the standing figures, included a wall trim to create depth, and added carpet and wall texture. Our customer was also delighted that we had fixed her fathers arm and made other personal touches to her treasured family photo. 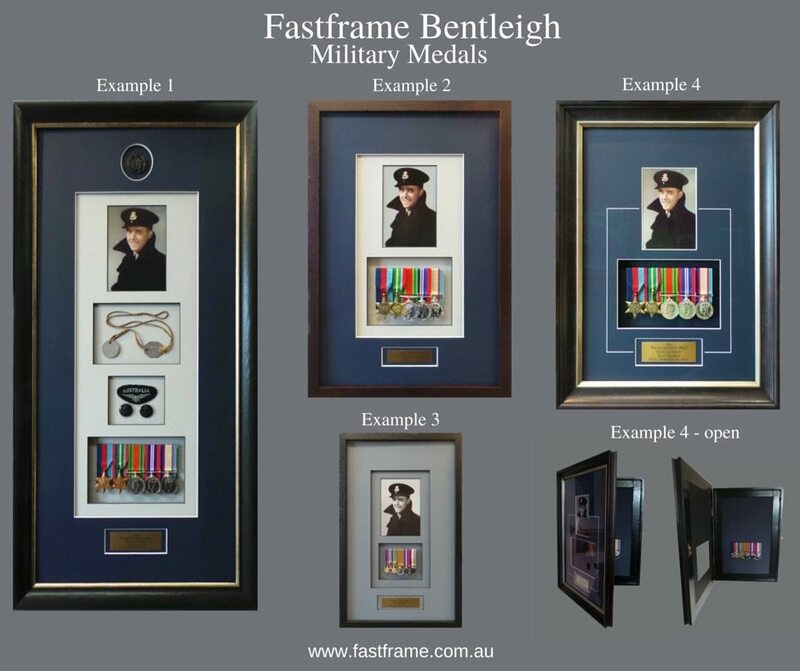 A customer asked Fastframe to update the framing of her father’s medals. He was a Band Sergeant Major in the Scots Guards who was awarded the B.E.M. (British Empire Medal). Unfortunately, the medals were in poor condition, so we asked David Hirsh our expert Medalist for assistance. David cleaned the medals, renewed the ribbons and court mounted them, bringing the medals back to their original condition, befitting a Sergeant Major. In addition, our customer’s mother served as a Plane Spotter, which was also an important role in World War II. As a tribute to both of her parents, we worked with the customer to design a frame that included a picture of her mother and father and their medals. The photos needed restoration, resizing and reprinting. Our customer opted to use UltraView anti reflective glass, which highlighted and enhanced the images and medals, making a great tribute to the customer’s mother and father. With the centenary of the First World War upon us, my husband has been researching our relatives who had fought in the Great War. In the past, access to material from 1914 to 1919 has been limited to family records, however the internet has opened a lot of new resources for researchers. If you don’t know the details of relatives who may have served in WWI, a good starting point may be your family tree. In many cases a search on Ancestry.com.au can produce good results. For our family, we knew of several WWI diggers, however searching the family tree, we found over 10 and also several surprises. 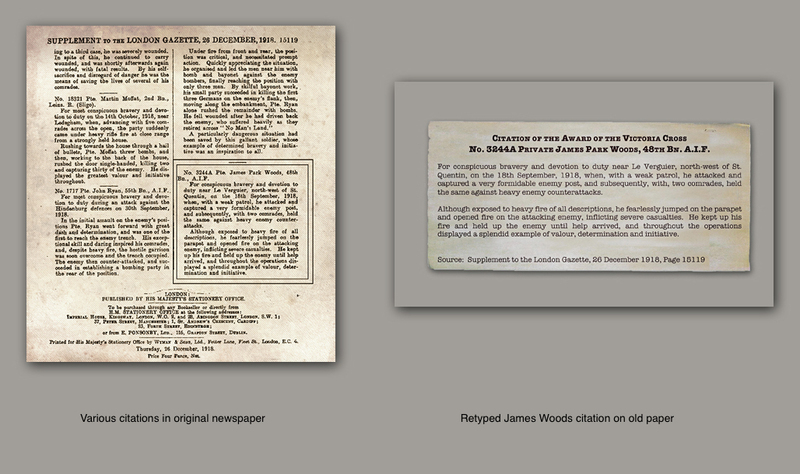 For this article we will focus on James Park Woods, a distant relative who was a WWI Victoria Cross winner who had a lot of material available. With details of the digger at hand, the usual first stop is the WWI Nominal roll, or the WWI Embarkation roll, however, for our digger these searches surprisingly drew a blank. A newer source of information is the AIF Project which includes material from several sources. This proved a great summary of James’s AIF service. In addition, you can also access the WWI diggers AIF record at the Discovering Anzacs site, which allows you to download a scanned copy of their service record. Photograph – several photos of James are available on the internet, however we wanted to restore the image and highlight his VC. The following shows the original image, the restored version and finally with his VC ribbon in colour. Medals – we understand that James original medals have been donated to the Australian War Memorial in Canberra. Therefore, after researching what medals James received, we asked our medal expert, David Hirch (03 9571 5469) to get replicas for us. David can also assist with the refurbishment and mounting of your original medals. Service Items – Customers often have access to original service items that can be framed. For example we have framed dog tags, pay books, service patches etc. In this case we decided to frame a copy of James VC award which we obtained from the internet. For better presentation, we cleaned up the document and formatted it as one page. With these three elements we then set about designing a suitable arrangement, and selected appropriate mats and frame. The completed frame is a suitable tribute to the memory of a very brave and courageous man. At Fastframe we are often asked how we can help preserve and share family heritage items with different family members. A good example is my husbands old family home Certificate of Title. As several family members wanted a copy of the certificate, we scanned the front and back, leaving it in its original condition, creases and all. We then reduced the image and printed both sides on a grey background. The prints were then framed in a style to suite the period, and glazed in Tru View AR Reflection Free amazing clarity glass which enhances the three-dimensional look. The original certificate has been restored and kept safe away from sunlight. Now all family members can have their own piece of family history !. Continuing our series on photo restoration, light restoration and medium restoration, our last example is when ‘heavy’ restoration work is required. Fastframe have been doing photo restoration for many years. Along with our own skills we’ve been excited to see the technology also improve, and it’s amazing what can be done to restore photographs today. Last year we also bought a fantastic wide format photographic printer that allows us complete control of all our customers printing needs. Being able to colour match and print your photographs in the original colours is something that we pride ourselves on; the smallest changes can have a dramatic impact. Photo restoration can range from a few small ‘tweaks’ to remove minor blemishes, to significant repairs. The photo we have used for this post is a perfect example of what we would categorise as ‘heavy photo restoration’. Clearly the differences between the two photo’s are significant as there has been a considerable amount of work done on the image in general and to specific sections. When you compare the two photo’s the restoration is obvious and extreme, so let’s break it down the process a little so you can see more clearly the steps involved. We have repaired the cracks (most obviously on the right, towards the top). These cracks appear when the image lifts away from the paper; most frequently when a photo has been folded or creased. Always store photographs flat (ideally separated by ‘acid free’ tissue paper). This will also help reduce the likelihood of damage from scratches and creasing. We enhanced the faded areas of the photograph. Water, heat or sun exposure causes photographs to fade (in the original image these sections have discoloured to a yellow colour). We’re unsure what caused these yellow sections to occur on this photograph, however as the photo was taken circa 1929, it’s very existence is remarkable and something our customer wanted desperately to ‘preserve’. We also restored the facial features on the young boy (standing far right). His face was moderately obscured by cracks, discolouration and general wear and tear. The restoration is multi-layered and the final result is dependant upon each of these elements. Finally, what pulls all of these changes together is the overall colour of the restored photograph. From looking at the original you’d expect it to have been sepia when printed. However, that’s not the case, it’s the ageing of the photograph that’s changed the ‘white’ area’s to brown. When it was first printed, the photograph was black and white. An example of the changes made to the picture can be seen in this video. If you have any photo’s that you would like to have restored you can upload a copy to our site or drop into the store so that we can discuss your needs. We also have a high quality scanner that can convert your photos (of virtually any size) to digital images. 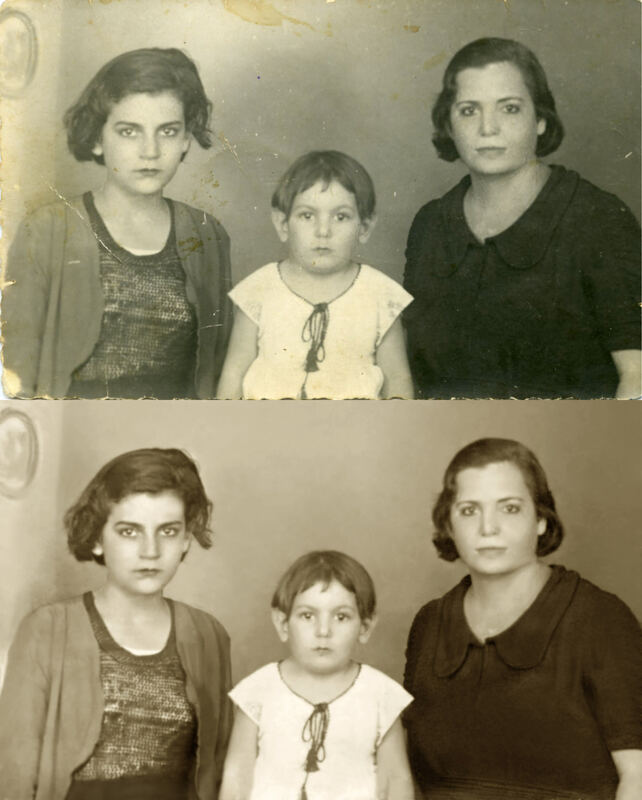 Continuing with our recent series of posts about photo restoration, we have an example of ‘medium’ photo restoration. All these photo’s were for the same customer and all required varieying degrees of restoration. When looked at a group, it is interesting to see how photo’s from the same time period have deteriorated at different rates. Like the ‘light’ restoration example, the main problem with this photo is fading and need for colour correction. In addition, although difficult to see in the small version of this photo there are also significant scratches, white marks, stains and damage to the edges of the photo. For example, see the slight discolouration at the top of the photo and also beside the young girls head and also small scratches and damage on the left side. We repaired all of the damage, printed the photo in light sepia and then framed a copy of the restored photo for the customer, they were thrilled at the result. At Fastframe, we have an extensive range of Frames, Matts & Art to suit all tastes. Fastframe will be closed from the 19th April until the 25th April, for the Easter & ANZAC day break, reopening again on the 26th April.